CommonKindness is proud to present February’s Official Recipient of the Partner in Kindness Award for going above and beyond in spreading the message of kindness to their community. “I am so honored to be chosen as your partner in kindness! I was raised to believe that being a helper or looking out for others is just what you do. Unfortunately, that is not the norm so it’s absolutely refreshing to find companies like Common Kindness that live by that rule. You set the bar for the rest of us! Let me start off by saying, I am NOT a coupon site! However, there will be times that I share a few here and there. That’s because I fully believe in what Common Kindness is doing. If you haven’t heard of them before, then you need to check them out. You can get a number of fantastic coupons there but what makes them different is every time you use one of their coupons, they provide funds to a non-profit of your choice! Isn’t that cool? I believe there needs to be a little more kindness in this world. It doesn’t matter who is on the receiving end; it could be a neighbor, a stranger, or even an animal. As long as we are sharing kindness, we are changing the world. You may not even know that your smile of acknowledgment to a stranger may be the difference between his/her deciding to take his life that night. It’s amazing what a little kindness can do! 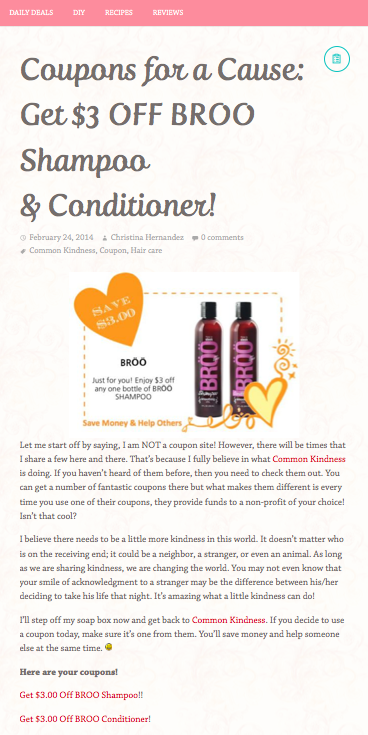 This entry was posted in printable grocery coupons and tagged broo coupon, coupons, kindness, partner in kindness, printable coupons, short and sassy deals by commonkindness. Bookmark the permalink.